Thirty years ago when my dad was stationed in the Navy, he spent a lot of time here in Philadelphia down at the Navy Yard. Back then, I bet he never imagined one day his daughter would be living in Philly and enjoying delicious, roasted fare right inside the gates he passed in and out of every day. That’s right – this week’s burger adventure takes us to Marc Vetri’s newly opened, Lo Spiedo. Aside from pork ribs, chicken and a spit-roasted octopus (! ), Lo Spiedo also cooks up Creekstone Farms brisket and uses that brisket in it’s burger. You can opt to get it topped with bacon, cheese or grilled onions, but who likes to choose only one topping? I went with cheese AND grilled onions. 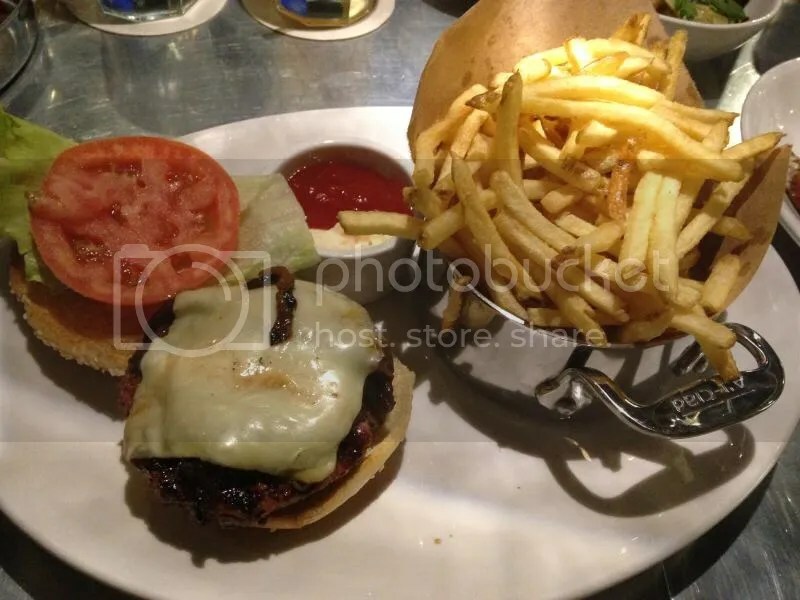 The burger also comes with lettuce and tomato, and a side of ketchup & mayo for your shoestring fries (seriously, fries dipped in ketchup & mayo is the best). The burger was cooked slightly more on the medium well side, but was still delicious and juicy. The brisket patty was super moist and flavorful; I can’t wait to try a regular cut of it. The bun was a soft, seeded roll, perfectly proportional to the patty, and didn’t get soggy from any burger juice runoff. The grilled onions also added a nice flavor. And for $10 during happy hour, it was a steal! Just make sure you bring your appetite: there are so many other amazing snacks on the happy hour menu that we might have gotten a little overzealous and ordered almost all of them. But no matter how full you are, don’t forget to finish your fries! Posted in bacon, brisket, buns, burger, cheese, Creekstone Farms, happy hour, Lo Spiedo, Marc Vetri, Navy Yard, onions, roasted, South Philly. Bookmark the permalink. I’ve been eyeing this place ever since it opened but haven’t ventured down to the Navy Yard yet to try it. Sounds like a winner! And I LOVE the little fry “basket”. +1 on the ketchup/mayo combo.